RENO, Nev. – Not many would stare a beast in the eyes. Fewer yet would tangle with it. But nine men will get that opportunity Sunday-Thursday when the Bullfighters Only Tour hits western Nevada for a four-night affair in conjunction with the annual Reno Rodeo. 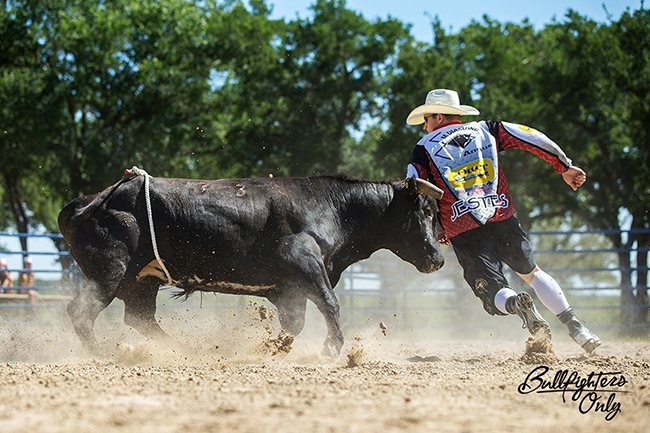 “Bullfighters Only almost started by accident,” said Nate Jestes of Douglas, Wyo. “Aaron Ferguson started his website, and we were to showing off our abilities as a way to market the website. It was set up as a place for bullfighters to get things they might need. It was going to be a one-stop shop for bullfighters. The tour was established, and the Reno Rodeo will be the 13th of more than 30 stops through the regular season. Freestyle bullfighting is not new to rodeo, and the Bullfighters Only has created public demand for the sport. The events feature man vs. beast in a head-to-head battle inside an arena. The bullfighters utilize their tremendous athleticism to try to outwit and outmaneuver equally athletic bulls, which were bred for this kind of fight. Jestes and Rutkowski will be joined in Reno by Schell Apple of Fay, Okla.; Beau Schueth of O’Neill, Neb. ; Evan Allard of Vinita, Okla.; Cody Greer of Chelsea, Okla.; Chuck Swisher of Dover, Okla; Zach Flatt of Fittstown, Okla.; and Ross Hill of Muscle Schoals, Ala.
“In my opinion, Bullfighters Only is the most elite set of guys that have ever been involved in freestyle bullfighting,” Jestes said. “There hasn’t been a set of 15 guys that are as strong and as talented that are going down the road at this time. It’s not only the elite guys, but the elite bulls, too. The growth of the BFO has been phenomenal. It features the top 15 in the sport and has reached more than 50 million people through its Facebook page with more than 12 million video views. It’s Instagram page has more than 51,000 engaged followers. Bullfighters Only paid out more than $125,000 to the contestants that play the game. From national television coverage through its relationship with bull riding and The American to regular coverage on Rural Radio-Sirius 147, the buzz has continued to build. The bulls are bred to be aggressive, and nothing is done to make them that way. In Reno, retired bullfighter Darrel Diefenbach will provide the animals through his 12X Fighting Bulls. “This is an exciting time to see freestyle bullfighting,” Rutkowski said. “We, as Bullfighters Only, have brought back the extreme aspect of what us bullfighters do day in and day out. In fact, many of the most prestigious events in ProRodeo are on the BFO tour schedule. Events with that much history stand as proof to the incredible showcase that is out there for the Bullfighters Only athletes. Men put their lives on the line through bouts with fast, agile, hoof-pounding machines. It’s the measure of a man that will face any adversity and find a way through every step, and it’s heading to Reno starting Sunday. Each step the BFO has taken has been uphill and done at a rapid pace, but that’s the nature of freestyle bullfighting. Fighting bulls move quickly and swiftly, and the men who are in battle must do that, too, in order to not only be one of the best, but also to survive.